Enervex Fan Source... MFD Mechanical Fireplace Damper. Have a gas fireplace with an Enervex fan?... Add an MFD. 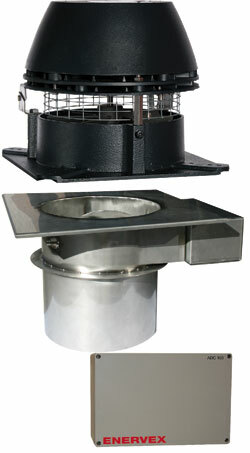 A chimney top mounted automated damper for use with gas fireplaces and model RS Chimney Fan. The MFD prevents excess heat from escaping through the chimney when the fireplace is not in use. 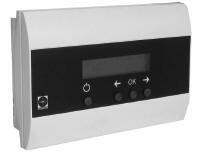 The ultra low profile MFD comes equipped with an actuator that is interlocked to the ADC 100 so it only opens when the fireplace is in use and draft is proven. MFD can be purchased separately. The environmentally friendly IntelliDraft quietly maintains safe and proper draft for the fireplace while protecting a home from dangerous chimney downdraft and fireplace spillage and saving energy. The IntelliDraft is the first completely automated venting control system for use with gas fireplaces and is ideal for multifamily buildings and single-family dwellings alike. 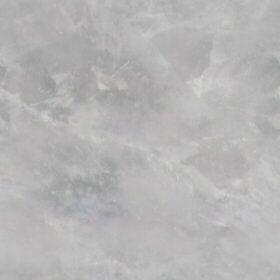 It assures safe operating conditions for a gas fireplace and other gas-fired, decorative appliances. It also saves energy and eliminates unnecessary emissions making it a true GREEN solution. Maintaining a proper and safe draft condition for the fireplace and the room providing it air for combustion are big challenges in today's tight construction. IntelliDraft is designed specifically to meet these needs. And all the user has to do is flip a switch! An elegant - and yet very simple – venting solution. The IntelliDraft is easy to install and the connection of the components is very simple. And all the components, except for a switch, stay out of sight. The illustration to the left shows the very simple set up. 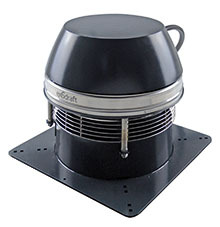 The IntelliDraft connects a draft and safety controller, the ADC150 and its pressure sensor, to an RS chimney fan, the MFD chimney damper and the fireplace’s gas valve. When the user wants to turn on the fireplace – typically using a wall switch – the controller signals the mechanical chimney damper to open. When the damper is open, the controller automatically ramps up the chimney fan speed until the draft set-point has been reached and the integrated draft protection switch closes. At this point, the controller allows the fireplace to fire by opening the gas valve. During operation of the fireplace the control continues to monitor the draft and will maintain the proper draft set-point by modulating the chimney fan speed whenever needed. When the user turns the fireplace or appliance off, the control leaves the damper open until all residual combustion products have been exhausted out of the building by the chimney fan; then the control discontinues chimney fan operation and closes the damper. If for any reason the draft set-point can’t be maintained during operation, the controller will completely shut down the fireplace or appliance operation. The EcoDamper system is an energy-friendly draft control and safety monitoring system for gas-fired fireplaces and similar decorative gas appliances. The system is designed to maintain safe and proper minimum draft required in the chimney while protecting the fireplace from dangerous chimney downdraft and fireplace spillage, two common issues. The system automatically shuts down the fireplace gas supply if unsafe conditions – often caused by “building depressurization” – occur. The product also closes off the chimney when the fireplace is not being used, saving energy and meeting the requirements of new, strict energy codes. And all the user has to do is flip a switch! There are only five components: An RS Chimney Fan, an MDF Mechanical Fireplace Damper, an ADC100 Draft and Damper Control, a Pressure Sensor and a Chimney Pressure Probe. • Downdraft protection. High winds outdoors can cause downdraft in the chimney, but the mechanically draft is more resistant than a natural draft system. • Spillage elimination. Depressurization in rooms with fireplaces can cause spillage, but EcoDamper's safety system will close the supply of gas, if the spillage is persistent. • Automatic shutdown. In the event that a safe draft condition cannot be maintained, the ADC100 control shuts down the gas supply for the fireplace. • Energy savings. At the same time, EcoDamper saves energy and meets energy codes by automatically closing off the chimney when the fireplace is not being used. An elegant - and yet very simple – venting solution. The EcoDamper system is easy to install and the connection of the components is very simple. And all the components, except for a switch, stay out of sight. The illustration to the left shows the very simple set up. 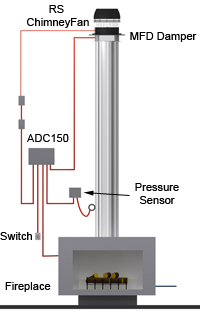 The EcoDamper connects a draft and safety controller, the ADC100 and its pressure sensor, to an RS chimney fan, the MFD chimney damper and the fireplace’s gas valve. At this point, the controller allows the fireplace to fire by opening the gas valve. When the user turns the fireplace or appliance off, the control leaves the damper open until all residual combustion products have been exhausted out of the fireplace and chimney by the chimney fan; then the control discontinues chimney fan operation and closes the damper. If for any reason the adjustable draft set-point can’t be maintained during operation, the controller will completely shut down the fireplace or appliance operation. Enervex?... but my new fan says Exodraft. 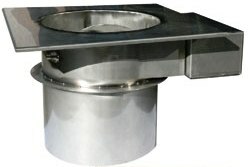 Enervex Fans... draft solutions for kitchen and pizza oven exhaust.